Text: It is a shabby street of the broader sort, packed with traffic, and lined with assorted shops. The hour is early and the crowd is of military age or under. The prevailing type seems to be the small boy in smeary cap and greasy trousers, smoking furiously at a cigarette gripped in the extreme corner of his mouth, rattling his money in his pocket, and swarming as to a scrum. The one word you catch for certain as he presses to the box-office is “Charlie.” They are all faithful subjects of the young Pretender. You pass through a door and a curtain, and are in almost absolute darkness. The only light is at the end of the room, where black-and-white figures are capering foolishly on the screen. Music of a mournful gaiety indicates the presence of a piano and a fiddle. You have the feeling that this has been going on since the beginning of time. A black shape collects before you, and flashes at you a flaming eye and a luminous hand. The hand grabs your check and a voice says sharply, “Stalls this way please!” The shape drifts away, you following. You are aware now of rows on rows of blackness, on either side of you, with a fugitive hint of faces that grows to a certainty as the drifting darkness halts, and flashes its luminous eye on a row of them. Stumbling over stretched legs, you fall into an empty seat. Here you are in an atmosphere of stuffiness, tobacco smoke, and vague mysterious voices, whispers, a treble giggle, a muted bass. And all the while, as in a nightmare, the meaningless pageant of the film parades. Gradually you settle into your environment. Puffing at your pipe, all your senses except the sense of seeing are lulled to a drugged security. The eyes are drugged, too, yet wide open and straining – fascinated, hypnotised by the phantom pictures of the film. The absurd legends do not make you laugh. In this mad word, “Maisie falls to it. Archibald is some boy,” do not strike a discordant note. But now that you have the hang of the story, and are, as it were, a part of it, the voicelessness of the actors oppresses. You are much relieved when an overburdened female suffer screams, “Look out! he’s got a knife!” Then the house roars, and for a moment the atmosphere is homely and healthy; but the next minute the nightmare grips you again. Wonderful things happen. There is an express train, with Maisie hanging on to the tail of it. There is Maisie dangling over a precipice and the villain hacking at her with a knife. There is Archibald catching a tameless steed, riding him through burning forests, over icy mountains, and finally falling with him down tall cliffs into a moonlit sea. There is pathos, too – Maisie and Archibald captured by gun-men, and torn from each other, he grinding his teeth, she weeping bitterly. And there is that great scene where Archibald, worn with torture and the loss of his meat-card, drags himself to the church just in time to prevent Maisie being forced into marriage to save the honour of her aged father. There is a sound of sniffling around you then. At last “The Lure of Sin,” in three parts (you have not even seen one part of it), is over, and the lights go up on a very strange assembly. The people sit bundled up in their seats, not yet half awake, their eyes blinking. A few couples still sit with arms interlaced, here and there a tired man or woman in shabby clothes, quietly sleeps. 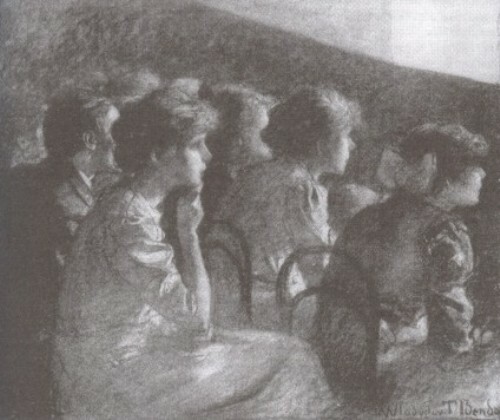 Attendants cry, “This way out!” Customers who have seen the round of the reels, and do not wish to see it again, respond to the invitation. Many of the boys, the cigarettes still in active eruption, are munching war-bread and margarine, and betting on Charlie for the next act. Charlie indeed it is, and, when he bounds into view, you realise the artistic function of the cinema. It is to present Charlie. His walrus waddle, his sham catastrophes, his polite entanglements, his amiable idiocies, his in frequent sudden bursts of harlequin fury, the trap-door motion of his saluting hat, the incomparable shuttle of his eye over his toothbrush moustache – all these things had necessarily to be part of a dumb show, and could only rise to their true pitch of extravagant impishness when Charlie had been squeezed to a black-and-white phantom on a screen. As a popular amusement the cinema lives on Charlie. We are farther west now, and the theatre has other airs. It advertises itself, but in a more reticent fashion. Its portico is more magnificent, and the commissionaire stands in a carpeted foyer. When you have entered the well-appointed theatre the lights are up, and the spectators look very like those you see at the play. But they are bored. In spite of the quite delightful music played by the orchestra, boredom stares out of nearly every face in balcony and stall. They have not come to a festival, they come to get doped. The film is a film one – a medley of many periods. Vast crowds manoeuvre in vast spaces, in colossal temples and palaces decked with monstrous idols or Christian monuments. There are fierce battles, desperate attacks and surprises. The drama is nothing, but the spectacle is grandiose. It is not as fine as Charley’s Aunt, but it is better than Rheinhardt. When you are out in the street again you take a deep breath. The carnal, common life is so dignified and fine. Comment: William Richard Titterton (1876–1963) was a British journalist and poet, and a severe critic of the cinema. His London Scenes documents aspects of London life during 1914-1918. The text includes line drawings of a small cinema showing ‘Vitagraph Grand Pictures’ and a grander cinema showing ‘Triangle Plays’. This entry was posted in 1910s, Travel writing, United Kingdom and tagged Advertising, Audiences, Boredom, Box office, Cinemas, Intertitles, London, Money, Music, Performers, Smoking, William Titterton. Bookmark the permalink.